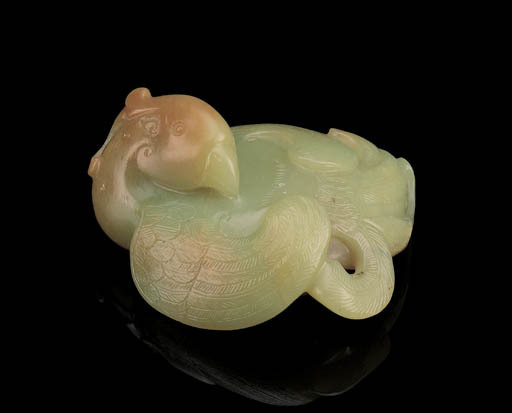 A celadon jade figure of a bird in a very similar posture, dated to the Song-Ming dynasties, was included in the Spink exhibition, Chinese Jade, An Important Private Collection, London, 1991, illustrated in the Catalogue, no. 61; and another in the form of a goose, from the British Museum, was included in the Oriental Ceramic Society exhibition, Chinese Jade Throughout the Ages, Victoria and Albert Museum, London, 1975, Catalogue no. 243. Cf. also the Tang dynasty prototype, a hat ornament in the form of a bird with its head turned back, illustrated ibid., no. 235. The present phoenix figure also shares many similar qualities with another yellow jade phoenix carving from the Hartman Collection, illustrated by Robert Kleiner, op. cit., no. 35.